Yesterday, I checked out the classic novella Who Goes There? Today I look at the first film adaptation. 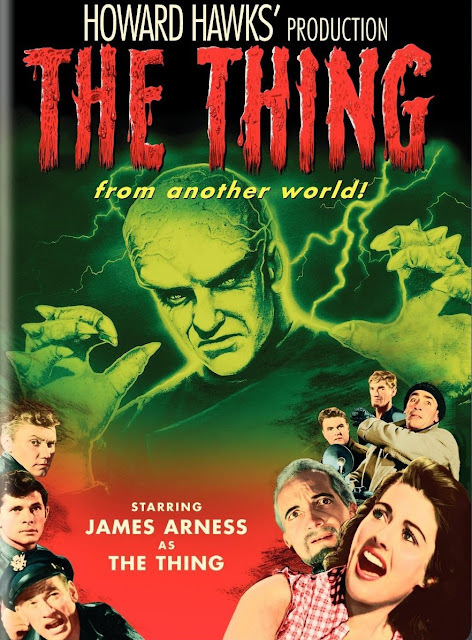 The Thing From Another World (1951) is Howard Hawks' classic film that is loosely based on the novella, Who Goes There? Scotty the newspaper man arrives at a northern military base to do a story. As they chat about an Arctic research facility where Captain Patrick Hendry's love interest is stationed, the captain is called away and ordered to investigate a crash near that outpost.Once at the base, the captain checks in with the girl he's seeing and then meets with Dr. Carrington. Carrington tells him about the strange impact and how it leveled off and gained altitude before crashing. They organize a team to investigate. This is another older science fiction film that has aged rather strangely. Coming off the danger the Hiroshima bombing, this film acts as kind of a backlash against the overreach of science. When viewed today, this seems tired and overdrawn especially given the political controversies. There's also a certain anti-authoritarian power of the press subplot that's used for comedic effect until it takes a strange messaging turn at the end. Captain Patrick Hendry gets a lot of crap about being in love with Nikki and being a strict military man. He is the man we're meant to side with, but he's often stuffy and militaristic. Nikki is a hard drinking and tough talking girl who's kind of a flirt. She helps to thwart Dr. Carrinton's initial mutiny and even mentions another way to fight the Thing. She has some great sarcastic comments and would have been way better if not relegated to the role of romantic interest. Dr. Carrington wants nothing more than to study and try to reason with it. He plots behind the captain's back to try to capture the creature. He believes it will reason with him despite their differences. He ends up as a raving mad scientist and becomes more annoying than menacing as the film goes on. Ned 'Scotty' Scott is a newspaperman skeptic. He comes up against military red tape when he tries to release the story about the space man. He ends up being more comic relief than anything. The Thing is unleashed by accident when one of the soldiers tosses an electric blanket over the block of ice it's frozen in. It isn't freed until about halfway through the film. The Thing is a plant monster that is nearly immune to man's attacks. It seeks to spread its seed pods and feed upon the Earth's animals. This is an unfortunate dumbing down of the Things abilities due to the budget constraints of the era. It ends up being more Frankenstein than Thing. The icy wastes don't feel like much of a constraint. They are decently rendered and look rough, but the characters treat it more like a slightly tougher nuisance. Inside the base it runs more like a basic lodge than an Arctic base. It isn't until the heat is knocked out that things actually begin feel more desperate. The end is even more abrupt than the end of the novella. A final confrontation happens followed by an inspirational speech by Scotty. Unfortunately this film relies on many scientist, military and journalist stereotypes to fill out its cast. While Nikki breaks the mold, she doesn't get much more to do than romantic banter with the captain. There's a lot of military protocol and inane chatter that could have been streamlined throughout the first half. The tension and mistrust of the original story is lost to human stupidity. This film is better off when not compared with the original story, though I think it remains a bit dry. It is an interesting look at classic postwar science fiction. Tomorrow, I take a look at John Carpenter's The Thing!